Prediction intervals on Deming regression are a major new feature in the Analyse-it Method Validation Edition version 4.90, just released. A prediction interval is an interval that has a given probability of including a future observation(s). They are very useful in method validation for testing the commutability of reference materials or processed samples with patient samples. Two CLSI protocols, EP14-A3: Evaluation of Commutability of Processed Samples and EP30-A: Characterization and Qualification of Commutable Reference Materials for Laboratory Medicine both use prediction intervals. 1) Open the workbook EP14-A3.xlsx. 2) On the Analyse-it ribbon tab, in the Statistical Analysis group, click Method Comparison and then click Ordinary Deming regression. 3) In the X (Reference / Comparative) drop-down list, select Cholesterol: A. 4) In the Y (Test / New) drop-down list, select Cholesterol: A. 5) On the Analyse-it ribbon tab, in the Method Comparison group, click Restrict to Group. 6) In the Group / Color / Symbol drop-down list, select Sample Type. 7) In the Restrict fit to group drop-down list, select Patient. 8) In the Prediction band edit box, type 95%. NOTE: Select the Familywise coverage check box to control the probability of simultaneously for all additional samples rather than individually for each sample. 9) On the Descriptives task pane, select Label points, and choose Additional groups only. The report shows the scatter plot with fitted regression line and 95% prediction interval (see image below). The regression line is only fitted to the points in the Patient group, as set in step 7 above, and additional points are colored depending on the type of sample, as set in step 6 above. Any points outside the prediction band are not commutable with the patient samples, and in this case you can see sample ‘c’ is not commutable. The commutability table shows the additional samples and whether they are commutable or not with the patient samples. The steps to perform an EP30 study are the same as described above. You should note that EP30 forms the prediction interval using the fit of the patient samples and the precision of the reference materials, where-as Analyse-it uses the fit and precision of the patient samples. We chose to implement it like this since there are usually too few reference material samples to establish a reliable estimate of the precision. We have extended the prediction intervals beyond the CLSI EP guidelines, so they support any number of replicates and are also available with Ordinary and Weighted Deming regression. This alleviates the need to log transform values as is recommended in EP14, which, although it corrects the constant CV, distorts the relationship between the two methods. If you have active maintenance you can download and install the update now, see updating the software. If maintenance on your license has expired you can renew it to get this update and forthcoming updates, see renew maintenance. Today we released version 4.60 of the Analyse-it Method Validation edition. The new release now includes 3 nested-factor precision analysis, which extends Analyse-it’s support for CLSI EP05-A3 multi-laboratory precision studies. If you have you can download and install the update now, see . If maintenance on your license has expired you can renew it to get this update and forthcoming updates, see . Today we released version 4.0 of the Analyse-it Method Validation edition. This is a major new release with many new features and improvements. The latest release of the Analyse-it Method Validation edition now supports 10 of the latest CLSI evaluation protocol (EP) guidelines. guidelines are world-renowned and are recognized by the College of American Pathologists (CAP), The Joint Commission, and the US Food and Drug Administration (FDA). The recent of passing of Professor Rick Jones (see ) caused me to reflect on the past. I was very fortunate to earn a work placement with Dr Rick Jones at The University of Leeds in the summer of 1990. Rick was enthusiastic about the role of IT in medicine, and after securing funding for a full-time position he employed me as a computer programmer. Early projects included software for automating the monitoring of various blood marker tests and software to diagnose Down’s syndrome. At the time many hospitals had in-house solutions for diagnosing Down’s syndrome, and although the project took many years and the help of many other people to complete, it eventually gained widespread adoption. 3-Jun-2014 Recent improvements in Analyse-it 3.76 and our first video tutorial! If you you will no doubt already know about the recent improvements in the Analyse-it Method Validation edition and the release of our first video tutorial. If not, now is a good time to since we post short announcements and feature previews on Facebook, and use the blog only for news about major releases. Today we released the Analyse-it Method Validation edition version 3.5. The software is feature complete, validated, and includes documentation. It supports Excel 2007, Excel 2010 (32- and 64-bit) and Excel 2013 (32- and 64-bit). We took this opportunity to rename the product from the Analyse-it Method Evaluation edition to the Method Validation edition. The product is the same, but the new name better reflects the intended purpose of the product. 14-Aug-2013 Join the Analyse-it Method Evaluation 3.5 public beta test and earn a free upgrade! Today we released the first public beta test version of the Analyse-it Method Evaluation edition, version 3.5. The software is feature complete and is validated – it is now only missing documentation. We invite everyone to download the beta and try the new version of the software before it is finally released in September. You will need Excel 2007, 2010, or 2013 (32-bit and 64-bit versions are supported) and it can be installed and used alongside older versions of Analyse-it so it won't interrupt your day-to-day work. 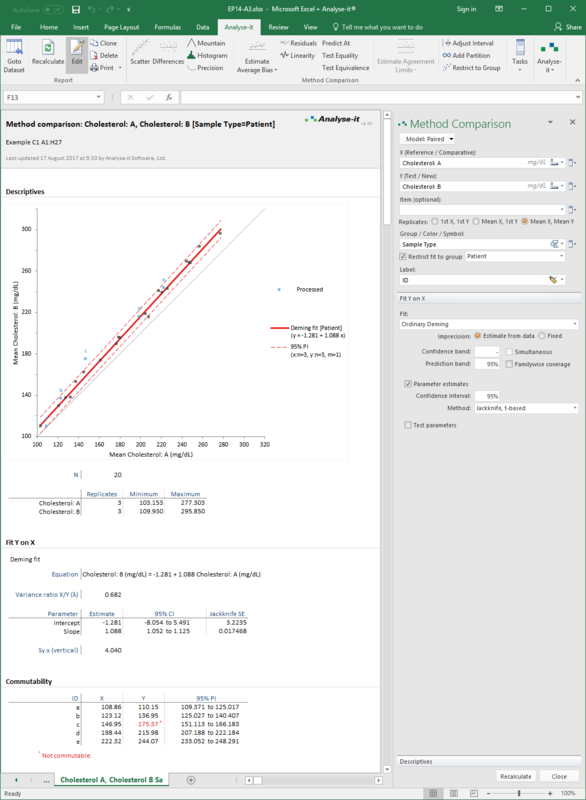 Today we released the 3rd alpha release of the Analyse-it Method Evaluation Edition 3.5. Alpha releases are versions of the software that are still in active development, but are released to small group of customers so we can identify and fix any problems before the public beta release. This release now completes the package with method comparison, which includes Deming regression, Passing-Bablok regression, and Bland-Altman difference plots. Linearity, precision analysis, diagnostic performance (ROC analysis and binary test performance) and reference intervals were already included in earlier alpha releases. Today we released the 2nd alpha of the Analyse-it Method Evaluation Edition 3.5. Alpha releases are pre-release versions of the software that are still in active development. We release them to a small group of customers so we can get feedback and quickly identify and fix any problems before the public beta release. If you want to take part in the test phase reply or comment on to this post or . You can use pre-release versions of Analyse-it alongside your existing version of Analyse-it, so it won't disrupt your work. And, if you help during in the test phases you will get a discount on the upgrade (a free upgrade for those who contribute the most) when the product is released later this year. We are now starting to release test previews of a major update to the Analyse-it Method Evaluation edition. The new release will include many new features (we'll reveal more in the coming weeks) and will support 32- and 64-bit versions of Excel 2007, 2010, and 2013. During the initial test phases we release development versions of the application to a small group of customers to ensure it installs and runs as expected on a wide range of PCs and configurations. The official beta test phase stage then follows where more customers are invited to download and use the software, while we iron-out the final few bugs before the official release. The official release is planned for summer 2013. Today we’re delighted to publish the second case study into the use of Analyse-it. The case study features a national clinical laboratory in the USA that offers more than 2,000 tests and combinations to major commercial and government laboratories. They use Analyse-it to determine analytical performance of automated immunoassays for some of the industry’s leading in-vitro diagnostic device makers -- including Abbott Diagnostics, Bayer Diagnostics, Beckman Coulter and Roche Diagnostics. Today we’re delighted to publish the first case study into the use of Analyse-it. Marco Balerna Ph.D., a Clinical Chemist at the in Switzerland, used Analyse-it when replacing the clinical chemistry and immunological analysers in EOC’s laboratories. Since the EOC provides clinical chemistry services to five large hospitals and three small clinics in the region, it was essential the transition to the new analysers went smoothly. Marco used Analyse-it to ensure the analyser’s performance met the manufacturer’s claims, to ensure the reporting of patient results was not affected, and to comply with the regulations of the EOC’s accreditation. Quantiles, Percentiles: Why so many ways to calculate them?